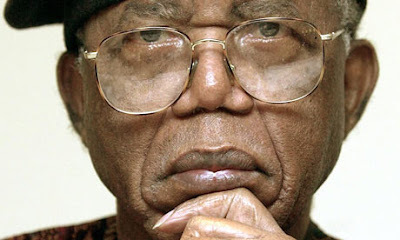 Chinua Achebe to advise on the new Penguin African Writers series. See this article in the Guardian today. See this page on Penguin's site for more info on their new prize for African writers. "The last 500 years of European contact with Africa produced a body of literature that presented Africa in a very bad light and now the time has come for Africans to tell their own stories,"
Oh boy! Still stuck on Conrad. Lost at the End: that's exactly what I thought when I read it. Africans are already writing their stories whether Euro-American publishers care to publish them or not. For me, it is strange that Penguin will chose to have Achebe on the editorial board when there are so many new young African writers that probably qualify more than him. They understand the pulse of their generation in the same way that Achebe understood what was necessary when he was in charge of the African writers series. Can't they give some young African writers a chance? I beg, I am tired of the constant rolling out of the drums for these old lot. Yes, they are important, I beg they should commot for road and let other young writers take over. I would recommend Teju Cole for that position. There's a mellifluous impurity to his writing that I think he won't allow voices that are still locked in a Conradian battle in. I will also have Berndine Everisto - I love her too much. Also recommend the guy that wrote the AFrican Psycho. I beg the west should stop dragging out the old Africans, and the Old Africans when they are dragged in, should recommend younger people to take over from them. Of course, we know who Mr Achebe will recommend!! "They understand the pulse of their generation in the same way that Achebe understood what was necessary when he was in charge of the African writers series." You talk am well. You could not have said it any better. But you know what their response would be: "what an old man can see sitting down a young man cannot see standing up." As an ancient, Achebe's vision of literature is believed to transcend the limits of history such that he and what you call "the old Africans" are somehow supposed to apprehend our own historical moment better than we can. "Oh boy! Still stuck on Conrad"
Make una dey there, me i don dey brush up on all my proverbs oh...infact, i get new one for today "it is circumstances that makes the butcher kill the cat and not the cow"(no ask me oh, na so i bin hear am but e be like say na Ghana version of "na condition make crayfish bend")...anyway, make una dey there...wey I finish una with moral, wisdom and history of Oshimili stream una go bow...that penguin series, i must to enter am, by hook or by crook..